Scottville High School bell finds new home at Spartan Community Field. Scottville High School bell finds new home at Spartan Community Field. 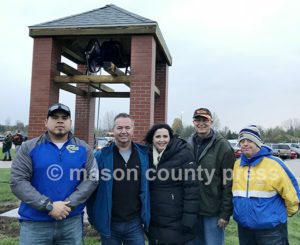 SCOTTVILLE — Some of the volunteers who helped restore the original Scottville High School bell gathered before the Mason County Central vs. Ludington High School varsity football game Friday at Spartan Community Field to commemorate the completion of the project. In February 2017, the bell was removed from the original high school, on North Main Street. It was donated to Mason County Central Schools by building owner John Wilton. MCC teacher Scott Dumas spearheaded the project and gathered volunteers. Those who helped included Nick Wagner and Andy Merkey of Zupin Crane LLC, who removed the bell; Rick Alway of Alway’s Service Center who sandblasted and painted the bell; Thalman Construction, which designed the bell tower; Jeff Barnett of Kelder Poured Walls who donated cement and labor for the tower footings; Bob Jensen, who donated masonry; Oscar Esquivel of OE Construction & Remodeling, who built the towner; Carter Lumber, which donated materials; Bud and Loreen Dodson, who donated the bricks; Scott and Kathy Dumas, who donated funds and time.